Contact Catering at 413-585-2304. Smith College Catering is not always able to cater all events at the Alumnae House. An off-campus caterer can be hired but must abide by all college policies, including carrying the appropriate insurance and licenses and following all house procedures. If you employ an outside caterer, we require that you have a college-approved site manager present. 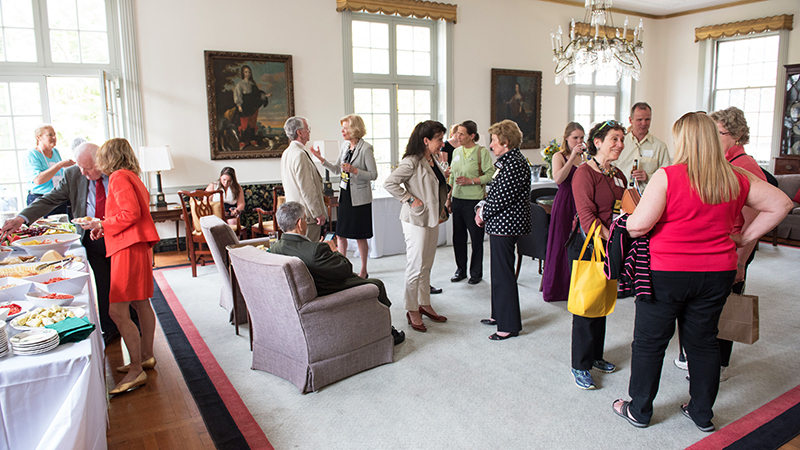 Events held at the Alumnae House after normal business hours require a receptionist at $11.50 per hour during the academic year. The charge for each site manager is $35 per hour. Site managers are hired to ensure that the event goes smoothly and that any Smith equipment is returned to its proper place. They are not hired to serve food or alcohol. Only beverages and finger foods may be served in the living room. Alcohol may be served to persons over the age of 21. The caterer must have a catering license that includes liquor, and certified bartenders must be used whenever alcohol is being served in the Alumnae House.